...since it hasn't been started yet. I cannot recommend the series enough. 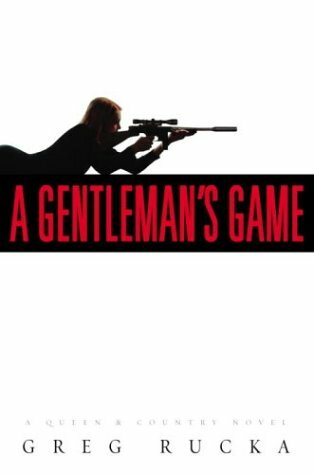 A Gentlemen's Game: A Queen & Country Novel by Greg Rucka. Currently reading The Day Before Midnight by Stephen Hunter. I spent last month reading all the Swagger novels by Hunter so now I'm starting on the stand alones. After that I will probably read Shoedog by George Pellecanos and Twisted, a group of short stories by Jeff Deaver. Currently on page 600 of Stephen King's DT7. Light - M. John Harrison -very interesting sci-fi. Weaves and connects two stories that take place 400 years in the future with one that takes place in 1999. Interesting ideas on quantum physics, furture discoveries and the nature of humanity. I pretty much felt the same when I read it. My dad just lovvvves Pynchon, and had gone on and on about Lot 49 for a long time before I eventually gave it a shot. It went along okay for a while, and then it just petered out in my opinion. It had a very unsatisfying 'conclusion'. Maybe one has to be a suspicious, socio-political paranoiac to really appreciate it? Just finished Woolf's Three Guineas, Morrison's Sula, and Aristotle's Poetics. Now reading Morrison's Playing in the Dark and Jazz. Phew! Almost 7 a.m. and I just finished Jonathan Strange & Mr Norrell by Susanna Clarke.Absolutely one of the best books I have read in a long, long time. Starts slow, but once it gets it's hooks into you, you're unable to stop reading. It's been called Harry Potter for adults, but, I really think that the Harry Potter reference will put people off. It is a superb fantasy and is highly, highly recommended. Finishing up Stephen King's It right now. Damn good book, and now that I'm out of school and still jobless I have time to work through the rest of Stephen King library that I haven't read yet. Next up, Pet Semetary and then The Dark Tower Series. Finished The Preserve , by Patrick Lestewka. I was enjoying it up until the halfway mark. Then, it had a WTF? moment where what you thinks gonna happen doesn't and something else comes out of nowhere. I mean I was into it, then BAM! I was taken out of it by the change of direction. Extremely violent, by the way. This guy sure can give Edward Lee a run for his money. I have just begun The First Man In Rome by, Colleen McCullough. Another long historical series (anyone know how many books in the series?). I've read the first few pages and I am intrigued. I just wish her editor had told her "enough with the exclaimation marks already!" Just checked out "The Cutout" (yet another CIA novel....I'm probably on some sort of list at this point) and "The Two Swords" (the new Drizzt book). Oh, and listening to "The Killing Hour" on cassette during times when I turn the XM off on the drive to work. I'm currently reading Cryptonomicon by Neal Stephenson. Next up, Nothing Sacred by Douglas Rushkoff and the brand new The Stone that the Builder Refused by Madison Smartt Bell. Just finished "Battle Royale" by Koushun Takami and & half way through "Plum Island" by Nelson Demille. Just starting Germs - Biological Weapons and America's Secret War by Miller, Engleberg and Broad. George R.R. Martin Game of Thrones for the second time.....Hoping against hope for the fouth book to be out by middle of next year.......Just finished Skinny legs and All by Tom Robbins, I don't know if I will read any more of him or not. Finished Fire by Sebastian Junger and starting The Chancellor Manuscript by Robert Ludlum. Just began Dune by Frank Herbert. I've been meaning to read it for ages and am now finally getting around to it.